In the Dedicated Team model outsource company provides IT professionals that will fully concentrate only on one client at a time, while client has full management control over the project and team. 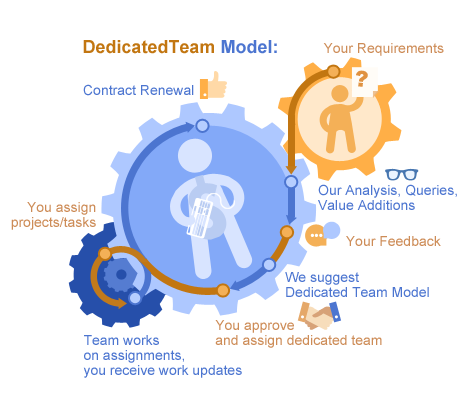 Dedicated Team is a business model where client and outsource provider mutually agree on the workload and project requirements for the specified amount of time and outsource company provides IT professionals that suit clients demands and will fully concentrate only on projects for one company at a time. Client has full management control over the project and team, while service provider is used for recruiting and administrative support. This option has quite transparent and simple pricing system: every month client pays service provider single sum of money that depends on the size and composition of the team, since it includes each team member’s monthly salary, plus provider’s fee that basically comprises administrative and infrastructure expenses and overhead. This model is usually used for long-term projects, where requirements are unclear and scope changes frequently. It is also used when client’s own team lacks skills or expertise in specific areas. The main aim of the dedicated team is to work seamlessly as part of client's team to provide quality, unique and project-specific solutions. Client specifies the number and skillset of potential employees. Provider searches for IT experts with the appropriate knowledge and potential. Experts are gathered into team and start work during regular hours. They constantly work only for the client’s project, get to know its specifics and see general idea behind each separate task. Outsource company becomes initial mediator between the new team and client, but with a time this team becomes more and more committed to their project and client’s company in general. Team members become part of client’s company and with the rest of client’s personnel adhere to the client’s corporate culture, management style, and project methodologies. They share company’s vision and are very interested in achieving company’s business goals. One of the main advantages of the Dedicated team model is that each team is assigned to just one client and each individual is assigned to just one team at a time. If individual is working on several projects for different companies simultaneously, delivery effectiveness and motivation will suffer. But in case of the Dedicated team model team members are always available for the requests and clients can manage resources and plan work volume at their own discretion with the maximum benefit for themselves. Time management and reporting are as simple as possible. Clients have full control over the project delivery and team work due to the clear project management, progress tracking tools and convenient interaction means. transmission of project knowledge and familiarity with the client’s business domain. client must take active role in communication and negotiation and invest a lot of time into management. In general, the Dedicated team model proved itself to be advanced cost efficient personnel management solution that balance team size and project workloads, facilitates skills exchange and on time project delivery.